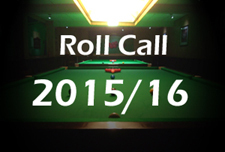 A year ago here at the Crucible I wrote about some of the quirks of watching snooker here at snooker’s most special venue, particularly in the first week during the tight, two-table stage of the World Championship. 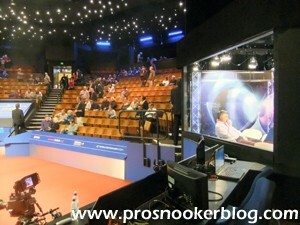 Today however marks the first day of this year’s semi-finals and the day when two tables become one, transforming the atmosphere at the venue, far more than is perhaps apparent from watching on TV. 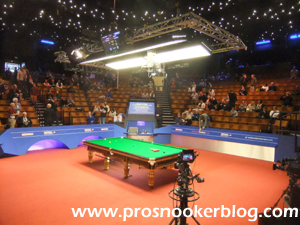 Of course, with two tables in situ, divided by the famous Crucible curtain during play, there is little room for manoeuvre for anyone on the arena floor, be it players, referees or cameramen. One of this year’s four debutants Craig Steadman notably banged his cue against the side of the arena on at least three occasions, joking that he was going to take that part of the set away if he were to hit it another time. 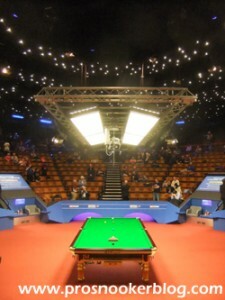 In reality, if snooker were to be looking for a new venue at which to host any tournament, let alone the World Championship, then a space as tight as that here for the first 12 days would not even be considered, in a way similar to that the layout for the Monaco Grand Prix would not be sanctioned but for its unique history in Formula One. But come today all of that has changed, with the players and cameramen now having oceans of space to walk in by comparison. 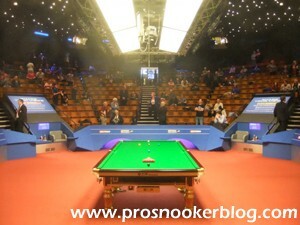 From being the tightest venue on the calendar, it has now become the most open, probably since the Masters when it was staged at the old Wembley Conference Centre. 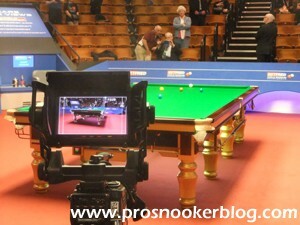 As was the case in 2014, the BBC have this year installed a TV studio in place of what has up until now been one of the photography booths and again it was noticeable from being in the arena for the opening session of today’s first semi-final that John Parrott and Ken Doherty could be heard, certainly from the media sits down by the table anyway. Thankfully, following the first frame and a few glances across from me when they were particularly loud (or more likely a word from another official), they seemed to quieten down and combined with less noise from the notoriously problematic earpieces during the past couple of days, there was an excellent atmosphere this afternoon. One man soaking up that atmosphere at the start of the session at least was Stuart Bingham, getting his first taste of the one table set-up ahead of his own semi-final this evening with Judd Trump. Of course it was an excellent victory last night for Stuart against five-time Crucible champion Ronnie O’Sullivan and as his opponent would admit during his press conference, a fully deserved win for the Shanghai Masters champion. He looked to be the better player for much of the match as Ronnie struggled to find his game and found himself at odds with referee Terry Camilleri on a few occasions. To his credit though, Ronnie spoke well after the match and made no excuses for defeat. He will be back next season and gunning for that sixth Crucible title to draw level with fellow greats Steve Davis and Ray Reardon. But it was Stuart’s night and he was understandably emotional following his victory, not just to avenge his defeat to Ronnie at the same stage here two years ago, but more importantly to reach his first World Championship semi-final after so many years. Standing between him and a place in the final will be Judd Trump, who dismissed China’s Ding Junhui 13-4 to reach the last four at the Crucible for the third time in five years. Now favourite with the bookmakers following Ronnie’s defeat and the man to beat in the eyes of many, it will be interesting to see whether he can justify such faith and indeed his own self-confidence which seems to be understandably high at the moment. Over in the other semi-final, Shaun Murphy already leads Barry Hawkins 6-2 after their opening session, perhaps unsurprisingly given the manner of Barry’s dramatic quarter-final victory yesterday against Neil Robertson. In a match of at times unbelievable quality, setting a record for the amount of century breaks made in a best of 25 match and equalling the all-time record for any match with eight, it was Hawkins who was able to claim a lower scoring final frame to book his place in the semi-finals for the third year in a row. Neil was probably of anyone this week the most visibly gutted post-match and I can understand why, given how well he had played and the opportunity that he no doubt saw to add a second world title to his CV this week. There were some nonsense comments online as to whether he had not been gracious in defeat but to me he was simply disappointed and to me he said nothing wrong at all. 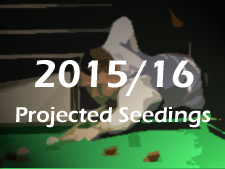 Although not fancied by many pre-tournament due to his form during the season so far up to this stage, Barry meanwhile has now eliminated two of the most dangerous players in Neil Robertson and Mark Allen to reach the last four and despite trailing 6-2, will remember that he of course was able to win his first semi-final here from the same position against Ricky Walden back in 2013. That said, it would be an even more impressive comeback if he were to repeat the feat against Shaun Murphy this week, the 2005 world champion having ended the challenge of impressive youngster Anthony McGill to reach his first semi-final in six years. As he has throughout much of the season, Shaun has looked confident all tournament and will take some stopping if he is not to claim his second world title.